Welcome to a new carnival! I am hoping we can all learn as weshare in Homemaking tasks. I love to sew. In fact, this year I am taking on a big project for Christmas. With 8 kids, their spouses and 19 grandchildren by then I have a lot of gift giving. This year I am starting now to get on to it and am making much, if not all of the gifts. Yes, I do realize that makes 35 gifts before I even go into any one else! I thought I would like to share some fabric resources that I use and see if you have any you can share with me. Freecycle: I have got bags of fabric from freecycle. Not always what I want, but when I take it I go through and then pass on what I do not like or know I would not use. This is a free source and one time someone was actually putting out huge lawn and leaf size bags of fabric. I am talking at least 15 -20 or more. I was not greedy and took 4. I got home, it was all new fabric, most with still having the yardage and price per yard on. There was a lot of the old polyester knits that I do not use much of so those were passed on. However, I got some really nice cottons, cotton knit, cordoroy and flannel out of it. Put away for future use. Thrift stores: dig around and look. I got 5+ yards of a heavy fabric like placemats and some tablecloths are made of. It is a pretty plaid and was about $3 for the piece. The Fabric Club: This is an online store that has some good specials. Sign up for their notices and you can see for yourself! Yahoo group coops: I just found these recently and have just placed my first order. Look through the groups and check it out. I am in a number of them. Be warned, they are busy and you may want to subscribe to the digest view as there are a lot of emails. NewestablishedCoops give a heads up on what is going on out there also. Colormeflannel, diaperfabricscoop, diaperfabricsupplies and HSBS are a few I belong to. You may wonder about the diaper sewing, I was going to make some cloth diapers, well was looking into it, and found these have other fabrics that are usefull for other things as well. There are other, many of them just do a fabric, sewing search. I am in ones for notions, thread etc. They are great. Warm Biscuit: This is a great shop for some vintage and unusual fabrics. While their prices are a bit higher on some things, they have great sale fabrics and fabrics you can’t find anywhere else. Have you ever heard of chalkboard fabric? Me either till I found some there! Blog giveaways: I have given fabric as well as gotten fabric on giveaways. Just look around. ebay: I saved this one for last, as I would imagine many people use it. If not, get in there and see what you can find! I have found some beautiful pieces on there for next to nothing. Also, when I was looking for Suzy Zoo fabric when my one granddaughter was on the way I found it there. Do not be afraid to ask sellers if they can get some other pattern for you. Some regularly sell fabric on there and I bought some from them and then asked if another one was available in their area. Different areas of the country have different prints and prices. I found everything I needed for that layette that way. There is always Walmart, fabric stores etc. For me they are far away and the selection is not great, but when I am near I do look. I have been burned often by Walmart, so really check it over. Only once have I had a problem with a fabric on ebay. The print was crooked and would not line up right no matter what, but out of all I purchased online that was the only piece with a problem. Walmart did me in good one Easter when I was trying to make 11 dresses and a few boys vests. Check it over! I hope these help you some. One more idea, check your mom’s, neighbor’s, friend’s stash! Maybe you can mooch! 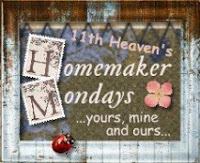 For other homemaking ideas go to 11th Heaven Homemaking Haven. Trouble comes in 3’s, So does humor! Hi Peggie! This is an amazing post! You sound like an awesome grandma! Thank you so much for your tips and where to find fabric. I have honestly never thought of these other resources. I usually just go to Walmart with their horrible selection. And the Walmart near us is completely doing away with the craft section soon! So, this is grat advice and I will definitely pass thiss on to my friends! Thank you so much and you just entered 6 times! See you soon! Sorry about all the typos. For some reason my monitor was showing my words in light yellow over the white and it was hard to read. Sorry! Hi Peggy, Thanks for stopping by my blog. I didn’t realize there were so many good resources out there for fabric. It’s nice to know that not everyone is stockpiling their fabric (like me) and never letting it see the light of day. It’s one of those chores I keep putting off. I need to unload some of it at one of these places. Thanks for the info! My favorite place to get fabric is from my friends and family. Anytime they are going to get rid of clothes, look at them and think of them as fabric, not clothes, The same thing when you go to the thrift store. Look on everything as just fabric and not what it is. I find a lot of those old circular skirts give a lot of fabric. I also go to garage sales and Goodwill of course. Look around your own closet. I’ll bet there are pieces in there that you just don’t like to wear but the fabric would be great for patchwork.